There is a full line of holsters available for your American Derringer. These can be ordered directly from American Derringer. To place an order, click the order button, and the ordering options will come up in a new window. All of our holsters and other accessories are available at the Derringer Store at 316 S. Lacy Drive, just down the street from our factory in Waco, TX. For years Uncle Mike's has meant excellent holsters designed for comfort, durability and usability. Like all of Uncle Mike's products, this holster is comfortable in even the hottest weather, and provides your American Derringer with a safe, secure place to hide. Available in right and left hand models. 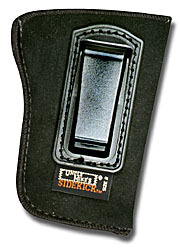 This holster is designed especially for the American Derringer Model 6. 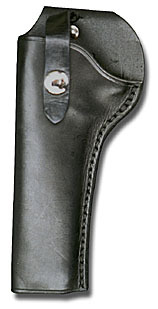 Manufactured from top-grade leather, this holster has a sturdy belt loop and a snapped restraining strap.